Most every pub you visit in Ireland will offer Guinness Beef Stew on the menu. Stewing the beef in Guinness stout beer tenderizes the beef and adds a robust, malty flavor to the stew. Guinness Beef Stew is one of those dishes where the flavor of the stew continues to improve the next day. 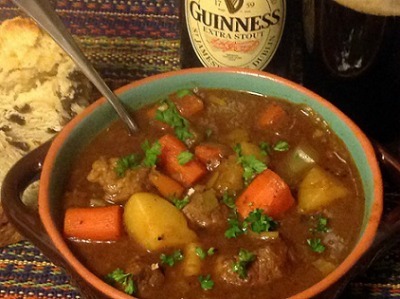 My son-in-law, Ben Weller, who is a lover of beer and Guinness, especially loved the flavors and heartiness of this stew. We have provided instructions to make Guinness Beef Stew on the stove top, slow cooker and Instant Pot pressure cooker. More delicious Irish recipes: Corned Beef and Cabbage, Corned Beef Bubble and Squeak, Irish Colcannon Potatoes, Irish Soda Bread, and Chocolate Guinness Cake. Stewing is an ancient method of slow cooking meats that has been used throughout the world. Traditional Irish stews (can be found documented as early as the 19th Century) also known in Gaelic as ballymaloe or stobhach gaelach. These stews were traditionally made with the cheapest and most readily-available ingredients using mutton (less tender sheep over two years of age) or lamb meat (neckbones or shanks) and root vegetables such as potatoes and onions with water. Irish stew makes more of a clear broth. Now days you will find more variety of root vegetables added such as carrots, leeks, parsnips or turnips with barley, and parsley. The original staple for Irish stew was potatoes which was easy to obtain. If the household was lucky enough to have a little meat, then adding to a stew was the best way to stretch the meat out to feed the family. Beef was available, but only affordable to British landowners. Your typical Irish cook would use lamb meat or mutton rather than sacrifice their only dairy cow. The addition of the neck bones or shanks also provided more flavoring to the stew. Each region of Ireland will also have their different version of stew. Southern Ireland will add barley which is an affordable and nutritious filler. Other regions may cap their stew with a crust of mashed potatoes making more of a shepherd’s pie. It is not clear in my research when stout beer was added to the stew as a meat tenderizer, fortifier, and flavor enhancer. Perhaps it was the ingenuity of an Irish pub owner? The Irish will argue that beef and stout beer does not make a true Irish stew. Therefore, you will find most Irish pubs will offer both Irish Stew and Beef and Guinness Stew on their menus. Irish-American immigrants started replacing lamb with beef in their stews since that was easier to find in the markets. The strong flavor of the stout beer pairs well with beef or mutton. When Guinness stout beer cooks down, in particular, it adds a nice roasted caramel and chocolately flavor to the stew. 500 BC – After the Celtic Invasion of Ireland, around 500 BC, which is also known at the Irish Iron Age, the cauldron became the dominant cooking tool to use over a fire spit. Goat meat and root vegetables were stewed together. 16th Century – Potato crops were introduced to Ireland from South America. Ireland is famous for it’s black stout Guinness beer which has been brewed in Dublin since 1759. Poor Irish workers and farmers lived for their pint of stout beer and considered it part of their diet. A pint of stout was known as “liquid food”. Guinness or other stout beers have been used as part of modern Irish cooking to help tenderize meat in stews and casseroles. You will even find Guinness used in chocolate cake recipes! Star Chefs Magazine, Beef and Guiness Stew, by Darina Allen. Chiciago Tribune, Dueling Stews, by Judy Hevrdejs, March 14, 2012. 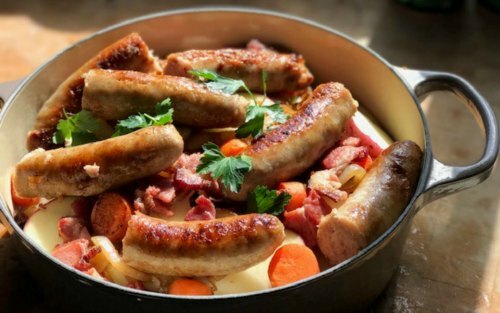 Ravensgard.org, A History of Irish Cuisine. The Kitchen Project, The History of Irish Stew, Food History. Serving Size: 8 to 10 servings. * Can substitute another stout beer of your choice. ** Learn how easy it is to make homemade Beef Stock or Beef Bone Broth in the Instant Pot Pressure Cooker. In a large soup pot or Dutch oven, over medium high heat, add 2 tablespoons olive oil and heat. While the olive oil is heating, pat the beef cubes dry with paper towels (moist meat will not brown, so this is an important step). Season the dried beef cubes with salt and pepper. Place the beef and 1/4 cup flour inside a medium bowl, stir together until the meat is coated with flour. Working in small batches, so the beef is not overcrowded in the pan (this will help beef brown faster), add the prepared beef cubes to the soup pot or Dutch oven and brown on all sides. When each batch of beef is browned, remove from the pot and set aside. Add the remaining olive oil to the Dutch oven and let heat up again. Add onions and sauté for 2 minutes or until translucent. Pour in 1/2 bottle of Guinness beer and combine with onions; bring to a boil and, use a spatula to deglaze the bottom of the pot, scrape up and loosen any browned bits from the bottom (any browned bits that may have stuck to the bottom of the pot while browning will be lifted and melt into the liquid). Add the tomato paste, garlic, sugar, Worcestershire sauce, thyme, white pepper, and bay leaves; stir together to combine and bring just to a boil. Reduce heat to medium and let simmer approximately 5 minutes. Turn heat back up to medium-high. Add the remaining beef, remaining 1/2 bottle of Guinness beer, beef stock, and beef bouillon (if needed add more beef stock or water to make sure ingredients are covered with liquid); stir until combined. Bring just to a boil again and then reduce heat to medium-low, and cover with lid. Let simmer for 1 hour, stirring occasionally and skimming off the fat from the top. Turn heat back up to medium-high, stir in the potatoes, carrots, and leeks. Bring just to a boil, reduce heat back down to medium-low and let simmer approximately 45 minutes or until beef and vegetables are tender. Skim off any remaining fat from the top and then add salt and pepper to taste. If stew needs to be thickened, in a small bowl, stir together the remaining 1/4 cup flour and 1/4 cold water until the mixture is a smooth paste. Slowly stir in a little of the flour paste into the stew, a little at a time, until the stew reaches your desired thickness. Remove and discard the bay leaves. Serve in soup bowls and sprinkle with parsley for garnishment. Excellent accompanied with Irish Soda Bread, and a glass of stout beer. In a large frying pan over medium-high heat, heat olive oil. Working in small batches, so the beef is not overcrowded in the pan (this will help beef brown faster), add the beef to the skillet and brown on all sides. 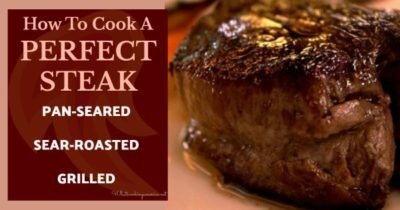 Remove each batch of beef from the pan and set aside. Add more oil to the skillet and let heat up again. Add onions and sauté for 2 minutes or until translucent. Pour in half a bottle of Guinness and combine with onions; bring to a boil and use a spatula to deglaze the bottom of the pot (scrape up and loosen any browned bits from the bottom). Add in the tomato paste, garlic, sugar, Worcestershire sauce, thyme, white pepper and bay leaves; stir together to combine. Bring just to a boil, reduce heat to medium, and continue to simmer approximately 5 minutes. To the slow cooker, add beef, onion mixture, potatoes, carrots, celery, leeks, remaining Guinness beer, beef stock, and beef bouillon (if needed add more beef stock or water to make sure ingredients are covered with liquid). Stir everything together and cover with lid. Let cook on low heat approximately 8 hours or high heat for 4 to 5 hours until the meat and vegetables are tender. Skim off any fat from the top and then add salt and pepper to taste. 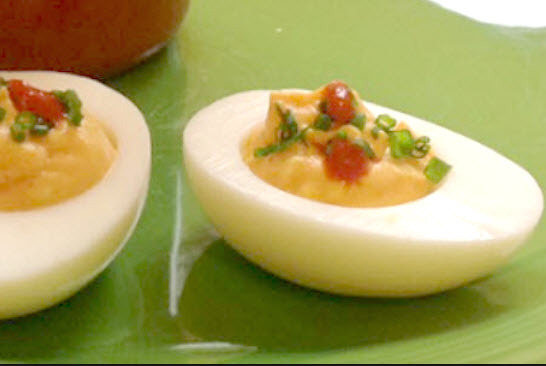 Serve in bowls and sprinkle with parsley for garnishment. Excellent accompanied with Irish Soda Bread. On the Instant Pot, Select the Saute button, then press Adjust until you see "more" appear on the screen. Once the screen reads "Hot", add olive oil to the inner pot and let heat up. While the olive oil is heating, pat the beef cubes dry with paper towels (moist meat will not brown, so this is an important step). Season the dried beef cubes with salt and pepper. Place the beef and 1/4 cup flour inside a medium bowl, stir together until the meat is coated with flour. Working in small batches, so the beef is not overcrowded in the pot (this will help beef brown faster), add the prepared beef cubes to the inner pot and brown on all sides. When each batch of beef is browned, remove from the pot and set aside. Add the remaining olive oil to the inner pot and let heat up again. Add onions and sauté for 2 minutes or until translucent. Pour in 1/2 bottle of Guinness beer and combine with onions; bring to a boil and, use a spatula to deglaze the bottom of the pot, scrape up and loosen any browned bits from the bottom (any browned bits that may have stuck to the bottom of the pot while browning will be lifted and melt into the liquid). Next, add in the tomato paste, garlic, sugar, Worcestershire sauce, thyme, white pepper, and bay leaves; stir together to combine and bring just to a boil. Press the Keep Warm/Cancel button to turn off the Saute mode. Add the beef, remaining 1/2 bottle of Guinness beer, beef stock, and beef bouillon (if needed add more beef stock or water to make sure ingredients are covered with liquid but no more than 2/3 full in inner pot); stir until combined. Cover with a lid and close to seal. Make sure the pressure valve is also closed. 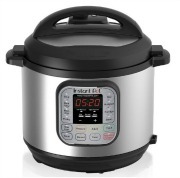 Select the Manual button at high pressure setting and set the cooking time to 20 minutes. When the cooking time has completed, allow to natural pressure release for at least 15 minutes. Once all the pressure has released and the pin has dropped, open the lid. Add in the potatoes, carrots, celery and leeks; stir to combine with the stew content. Cover with a lid and close to seal. Make sure the pressure valve is also closed. 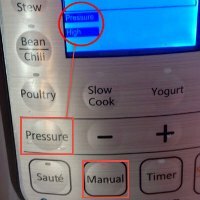 Select the Manual button at high pressure setting and set the cooking time to 10 minutes. When the cooking time has completed, quick release the pressure valve. Open the lid and add salt and pepper to taste. If stew needs to be thickened, in a small bowl, stir together the remaining 1/4 cup flour and 1/4 cold water until the mixture is a smooth paste. Press the Saute button, then the Adjust button until you see "more" appear on the screen. Slowly stir in a little of the flour paste into the stew, a little at a time, until the stew reaches your desired thickness. Remove and discard the bay leaves.